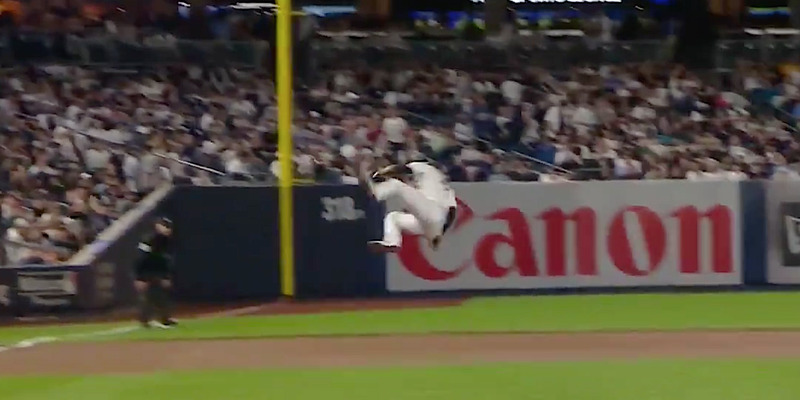 New York Yankees infielder Adeiny Hechavarria skied for an incredible catch against the Oakland A’s on Wednesday night during the American League Wild Card. 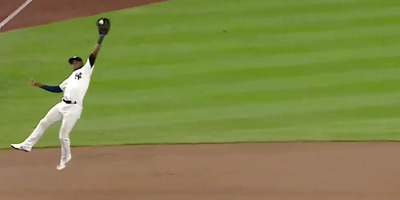 New York Yankees infielder Adeiny Hechavarria made one of the highlight catches of the MLB postseason on Wednesday night in the Yankees’ American League Wild Card game against the Oakland A’s. Hechavarria, a 29-year-old on his fifth team in seven years who played in only 18 games for the Yankees this year, was substituted in for his defence in the sixth inning. In the top of the seventh, after a mini-explosion from the Yankees that pushed their lead to 6-0, A’s shortstop Marcus Semien drilled a ball toward left field. That’s when Hechavarria skied for the ball like a wide receiver in the end zone, bringing it down for one of the most impressive catches you’ll see.